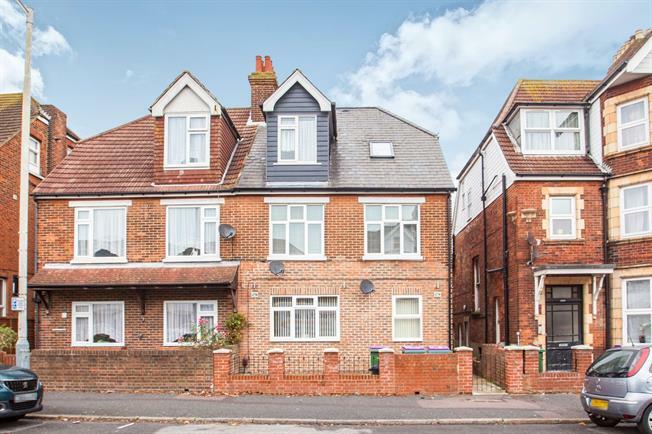 2 Bedroom Flat For Sale in Folkestone for Guide Price £140,000. Price range 140,000 - 150,000. Take a look at this spacious 2 bedroom apartment which will suit a variety of buyers. The property has everything you need with permit parking to the front making sure there is always a space, garden to the rear allowing you to enjoy those sunny days, 2 double bedrooms and in excellent order throughout allowing you to move straight in. One of the biggest features is the spacious open plan living / kitchen which is divided by a breakfast bar making this a great welcoming and entertaining space. The layout of the apartment is quirky and spacious with the entrance door to the flat on the floor below you have your entrance hall perfect for shoes and coats with stairs leading to a spacious split landing which could even be used as a study area. If that wasn't enough then there is loft above with pull down ladder and boarded out perfect for storing those seasonal items. The garden to the rear is access via a side gate and is shared with the flat below and also has a bike shed. Not only is this a great apartment it is a great location too, with the train station just yards away you also have a range of shops all within touching distance such as Dominos, Kentucky, newsagents, hairdressers and cafe. Then you have both Grammar schools again both within walking distance. Overall we feel this a fantastic purchase and welcome all clients to view the property to appreciate the accommodation on offer.